Social Media has somehow encroached into our everyday lives. Not really sure how exactly it happened, my first major Social Media addiction was Facebook, after joining in 2007. My first posts tended to be random, nonsensical, usually cryptic statuses, and aimed to make my life look mysterious. It was an incredulous ‘technique’ I had picked up from other Facebook users. Most of what I used it for initially though, was catching up with ‘old friends’. Being 21 at the time, it felt like the friends I had been out of touch with had been out of my life for so long… realistically though, with some, it had only been a couple of years. Gradually the way we used Facebook began to change, though it remained the same in one sense – a platform for people to parade their ‘amazing lives’ for all to see. Nevertheless, Facebook had its uses, as news travelled fastest via Social Media – for personal, local and worldwide news. Though Facebook was fast, it seemed Twitter was fastest. With the need to get that information faster, at some point I joined Twitter. I heard a lot about Twitter but never really understood the appeal. Limited to how much you can say in a Tweet, and not really having the same friend request process as Facebook, I didn’t understand much about how to interact. I guess the purposes I used Social Media for didn’t fit that particular platform. I joined Snap Chat, though mainly for the filters if I am honest. I checked my Social Media Accounts every day like something was going to change, but let’s face it, apart from the odd cute pet or baby pic, Social Media was becoming the same across most platforms – decaying our minds and taking over with the negative news, or ‘fake news’ as the term had now been coined. On Facebook I saw less and less on my newsfeed about my real-life friends and more and more stories about the bad that were going on in the world. As I constantly refreshed my news feed like the Social Media addict I was becoming, I was hounded by adverts or articles about Trophy Hunters, Trump, or Brexit. My escape from life was becoming my life. People were aggressive towards each other, attacking each other for having opinions. Nobody seemed capable of intelligent debate any more. People were hounding strangers – ‘Trolling’ became an everyday word because it had become so common it had been almost accepted as having its own place in Society. 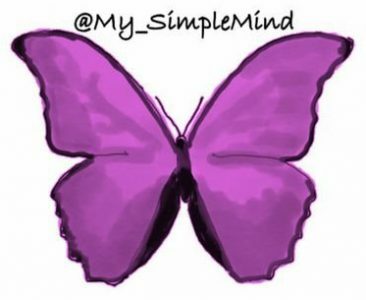 Wanting my own little world on Social Media away from the existing accounts I had (where I was known under my real name), I set up an alias ‘My Simple Mind’ in August 2017. The point of the account was so that I could say what I wanted without feeling I was in that same Social Media bubble I had been in on my other accounts – the ones where I was the ‘real me’. I tweeted random nonsense from the account at the time, and most of my tweets got little engagement and I had only a few followers. I never used the account regularly and often forgot I even had it. You never fail to amaze me SM. I went through a very similar experience with Facebook and ironically also joined in 2007 lol. Anyway, I love how we all use Twitter now. Whether it’s for spreading positivity, mh awareness and/or in my case, resisting. But I am sure so many people can relate to this post, especially older millennials. It’s crazy how much social media has changed and how much it has changed us. I can totally understand the need to make a separate account just to be able to have a space of your own where you aren’t bogged down or judged by what you post.